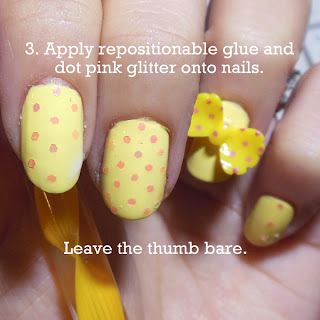 Yellow polka-dotted nails with acrylic bow on accent finger and sequin heart on thumb. 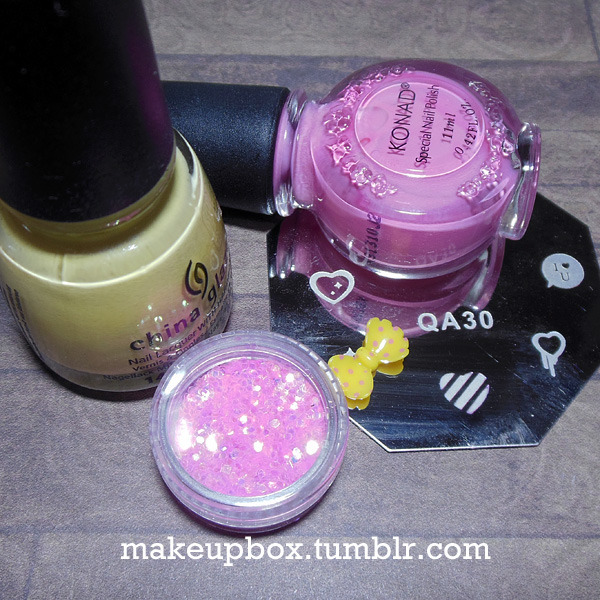 Items used from left: China Glaze Lemon Fizz, Konad pink special polish, yellow acrylic bow with pink dots, and pink translucent glitter. QA30 stamping plate from eBay. 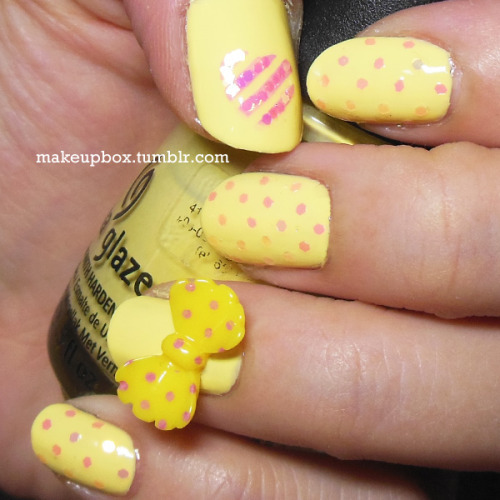 I was inspired by a pretty yellow acrylic bow and decided to do matchy-matchy nails to go with the theme. Apply pale lemon-yellow polish until opaque, and let dry. 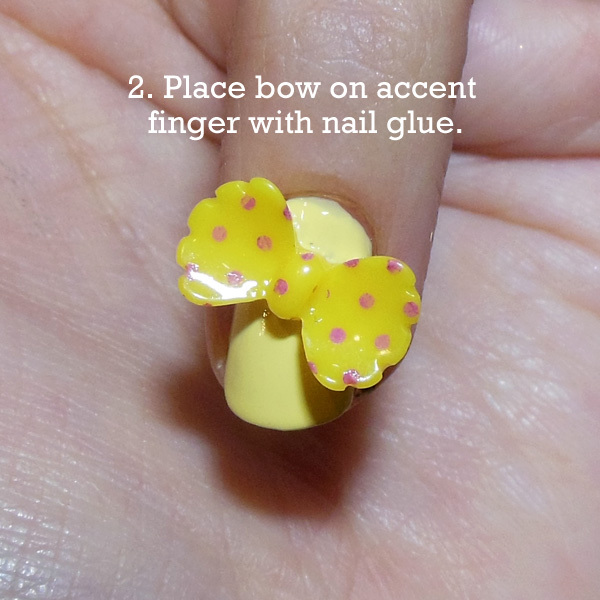 Use nail glue (or indeed, super glue) to apply the yellow bow to the ring finger. Remember not to use too much. This type of glue is stronger with just a thin layer. 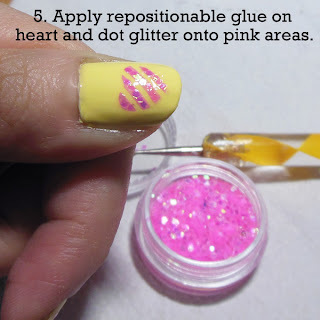 Make sure your repositionable glue dries a bit before you start dotting on the glitter with a toothpick or dotting tool, or they won't stick. Simply dip the tip of your dotting tool in a tiny bit of glue and let dry so the surface is tacky and it can pick up glitter easily. Repositionable glue is available from arts n crafts stores (scraperfect.com has a really good one called Best Glue Ever if you prefer to shop online; they ship internationally). 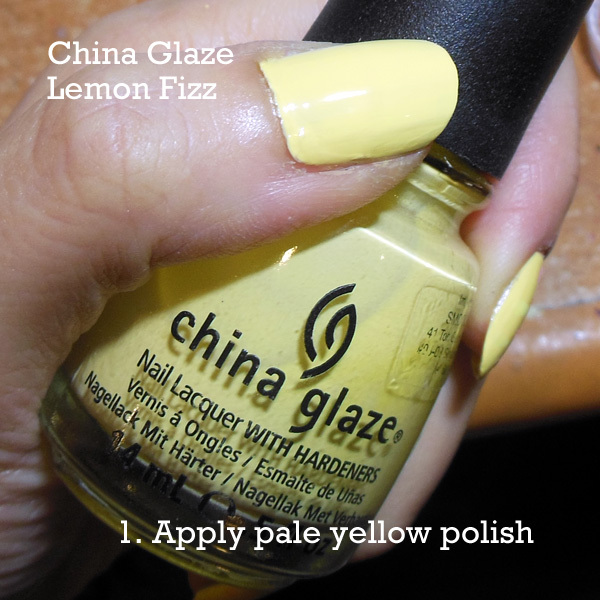 They're really the perfect thing for applying small pieces of nail art and glitter to your nails. For pink glitter, you can simply use any translucent duochrome pink glitter like the one I have above. It shouldn’t be too small in size or the dots won't be visible. Remember to let the glue dry before applying glitter! I used Seche Vite topcoat.